Posted on Wed, Nov 30, 2011 : 5:58 a.m.
Menlo Innovations, led by CEO Rich Sheridan (center), signed a 10-year lease for nearly 17,000 square feet of space in the bottom floor of The Offices at Liberty Square. McKinley CEO Albert Berriz (right) and Vice President Thomas Gritter said the space, which is known as Tally Hall and once housed Borders, will be nearly full when Menlo moves in. Ann Arbor software company Menlo Innovations signed a 10-year lease to triple its office space in a move from downtown’s historic Kerrytown district to East Liberty Street. In a deal with Ann Arbor-based real estate firm McKinley Inc., Menlo is set to move into 16,900 square feet of space on the bottom floor of the former Tally Hall building, which is now called The Offices at Liberty Square. It’s a particularly significant move for Menlo, which has received extensive publicity for its uniquely wide open, flexible office space and atypical work culture. But it’s also “indicative of the growth of Menlo,” CEO and founder Rich Sheridan said. Menlo, which celebrated its 10th anniversary earlier this year, has about 25 full-time employees in addition to a regular list of contractors who work for the company as business fluctuates. Today, Menlo has about 40 staff members, Sheridan said. 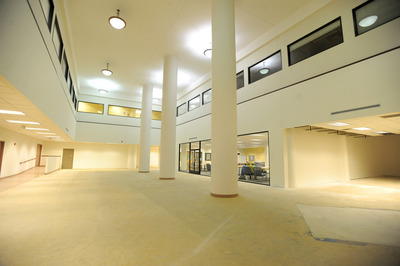 Menlo Innovations plans to move into this space at The Offices at Liberty Square. 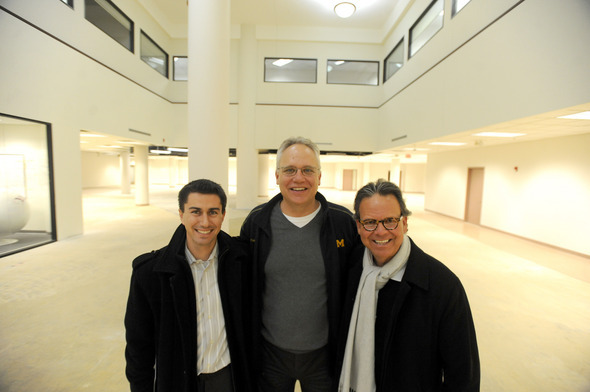 Menlo Innovations will share a glass wall with the 3,200-square-foot TechArb, an incubator for student-led companies at the University of Michigan. “I don’t think it’s unrealistic to say we can double the size of our team within a year,” Sheridan said. Sheridan said Menlo has achieved a record sales level in 2011, and he’s making a bet that the company’s growth would accelerate with a new, larger office space. He declined to offer details about new software development contracts the company has secured but said Menlo has experienced an influx in business. Still, he suggested that some prospective clients have avoided signing deals with Menlo because the company’s not quite big enough. More space means more room to grow. “For us, there’s a business imperative here,” he said. McKinley CEO Albert Berriz said Menlo’s relocation to The Offices at Liberty Square completes the entrepreneurial hub he’s been envisioning in the complex, which also houses the University’s of Michigan’s student-led business incubator TechArb. 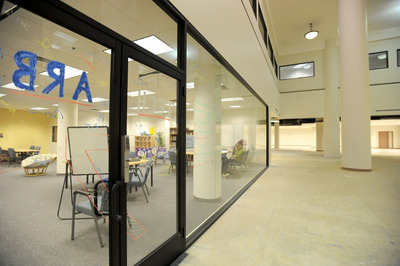 Menlo expects to move into its new office space around April, following the completion of extensive upgrades by McKinley, which has already significantly renovated Tally Hall’s interior. Neal Warling of Jones Lang LaSalle represented McKinley in the negotiations, and Diane Weisberg of Newmark Knight Frank represented Menlo. The office space, dotted with imposing 2.5-story white columns that support the Liberty Square parking structure, once housed the headquarters of bookstore chain Borders. The lease deal fills up most of the vacant space at The Offices at Liberty Square, which will have a few smaller suites left to lease, said Thomas Gritter, McKinley’s vice president and managing director of commercial real estate. Menlo currently occupies more than 4,000 square feet at its fourth-floor office at a historic office building on Fourth Avenue in Kerrytown, although the company has access to about 6,000 square feet there. Sheridan said the company’s lease for space in that building is expiring. Sheridan said Menlo would simply shift its culture of an open, collaborative workspace to the new building. Much like its current space, Menlo software developers won’t have assigned desks, computers or offices, although conference room space will be available. In many cases, Menlo developers work side by side at the same computer, generating ideas and developing technology for projects like Accuri Cytometers’ high-tech medical device. New Jersey-based Becton, Dickinson and Co., which acquired Accuri for $205 million in early 2011, continues to be one of Menlo’s largest clients. One of the biggest changes for Menlo is that the company will dedicate permanent space at the new office to host training exercises and classes for outsiders, an activity that already accounts for about 5 percent of its revenue, Sheridan said. Menlo, separated only be a glass wall, will be situated directly adjacent to TechArb, a 3,200-square-foot incubator for student startups. Sheridan, who said he envisions Menlo possibly starting its own business accelerator at some point, said Menlo welcomed the arrangement. “There’s a trend I see developing in this community of entrepreneurship flowing through the university and Ann Arbor SPARK to other entrepreneurial places like Menlo,” Sheridan said. Since the new space, which straddles Washington and Liberty streets, is not visible from the outdoors, one of Menlo’s priorities is creating a connection to the outside world. So the company plans to install a two-way video screen and camera on Liberty Street, where passersby will be able to wave to Menlo software developers and watch them work. Downstairs, Menlo developers will be able to see them and wave back through a connected screen and camera. “This will be the Menlo Software Factory,” Sheridan said. Thu, Dec 1, 2011 : 12:33 a.m. Wed, Dec 7, 2011 : 1:09 a.m. The company has been around for ten years and is expanding in a down market. I think that speaks for itself. Thu, Dec 1, 2011 : 5:29 p.m.
Thu, Dec 1, 2011 : 9:58 a.m.
Thu, Dec 1, 2011 : 12:16 a.m.
A sad commentary on where &quot;tech&quot; has gone. Tech jobs once attracted the best and the brightest; were held in high esteem. Now herded like cattle. I'm betting the average &quot;developer&quot; at Menlo makes less than a waiter at Applebees. Wed, Dec 7, 2011 : 1:07 a.m.
You would lose that bet. Menlo pays well and is a fun place to work. Look at their awards. They consistently rank high in &quot;Best place to Work&quot; competitions. Thu, Dec 1, 2011 : 6:11 p.m.
Chris, Thrones no. On the other hand, working on a &quot;spectated factory floor&quot; where it is &quot;fun&quot; sounds like a profession to you? Thu, Dec 1, 2011 : 10:09 a.m.
Oh but they get to be a part of a fabulous pre 90's tech burst hipster atmosphere, &quot;all inclusive&quot; automated caffine and sugar doses, balloon animals, other random &quot;perks&quot; and the priceless pretense of greater things to come. I just innovated this, I'm an innovater. We're all innovators. Great. Thu, Dec 1, 2011 : 1:10 a.m. I don't understand your disappointment. Were software developers previously working at thrones? Wed, Nov 30, 2011 : 5:35 p.m. I don't really understand exactly what Menlo Innovations does lol, but so long as they aren't involved in SEO or social media marketing or internet-use surveillance, woohoo, good for them and may their expansion continue :-) !! Wed, Dec 7, 2011 : 1:05 a.m. Borders was destroyed by Amazon and Kindle not over expansion. They expanded when they were doing well as they should have. Technology and people's preferences changed. Thu, Dec 1, 2011 : 10:10 a.m. Expansion for the sake of does not greatness make. Look at Borders. Wed, Nov 30, 2011 : 11:46 p.m. Wed, Nov 30, 2011 : 8:50 p.m. Wed, Nov 30, 2011 : 4:24 p.m. Excellent news for Menlo and our community! Go Menlo!! Wed, Nov 30, 2011 : 4:06 p.m.
A real win-win-win for Menlo+Ann Arbor+U of M. Congratulations Rich! Thu, Dec 1, 2011 : 10:35 a.m.
Because UM contributes so much to Ann Arbor's tax base.. oh wait. Yea! More tax Revenue for the city, more jobs and more people downtown eating,working and living! Thu, Dec 1, 2011 : 10:33 a.m.
&quot;more tax Revenue for the city&quot;: Don't count on it, check the records. With UM nearby expect some ill conceived break, subsidy or abatement behind it all. Also the drones get free caffeine and sugar pods and are evaluated based on the number of programming cycles they contribute to the hive. Don't expect them to eat out or &quot;live&quot; per se. Wed, Nov 30, 2011 : 1:42 p.m. Wed, Nov 30, 2011 : 1:15 p.m. I'm not a big fan of working in boiler rooms. They methods have other benefits, but as a person who has worked in &quot;cubicles&quot; and &quot;boiler rooms&quot;, I prefer the cubicles. Thu, Dec 1, 2011 : 10:37 a.m. Gives new meaning to the term &quot;Open Office&quot;. Taking workplace torture to an entirely new level. Thu, Dec 1, 2011 : 4:16 a.m. If your job requires you to be on the phone a lot, then an open boiler room layout can be a real problem due to the noise level. The boiler room layouts I've seen did not have desks &quot;sparingly placed&quot;. Everyone was quite close together. Even cubes can be problematic if neighbors are too loud. Wed, Nov 30, 2011 : 7:24 p.m. I don't think I'd like the boiler room either, but here at my place of work, we have a large office space with desks sparingly placed in optimal spots. There are no cubicles but also no main working room, we all have our own desks and computers, but everyone is accessible. I'm amazed more companies aren't getting rid of the cubicle set up, especially in areas that have more affordable space.